Revenue or turnover of Taiwan's businesses, described by the government chiefly as retail, wholesale and food services, totaled NT$14.5 trillion (US$460.31 billion) in 2014 to set a new high for the second consecutive year, according to Ministry of Economic Affairs (MOEA). In December, business turnover also hit a single-month historical high of around NT$1.3 trillion (US$41.26 billion), says the MOEA. The wholesalers and retailers saw 2014 revenue exceed NT$10 trillion (US$317.46 billion) and NT$4 trillion (US$126.95 billion), respectively, while the food service sector finished the year with revenue of NT$412.9 billion (US$13.10 billion), all of which beat record highs. Had there been no tainted cooking oil scandals during H2, 2014 to undermine consumer confidence, MOEA officials said total business revenue would have been even higher. Fortunately the good news is that businesses have gradually shed the shadow cast by the tainted oil crisis to have regained growth momentum since December, reflected in revenues generated by local retailers of food, beverage and tobacco, to have all showed positive growths in the month over a year ago to end the downturns beginning in September, says MOEA. Another driver of December business turnover in Taiwan was the Christmas and year-end sale booms. 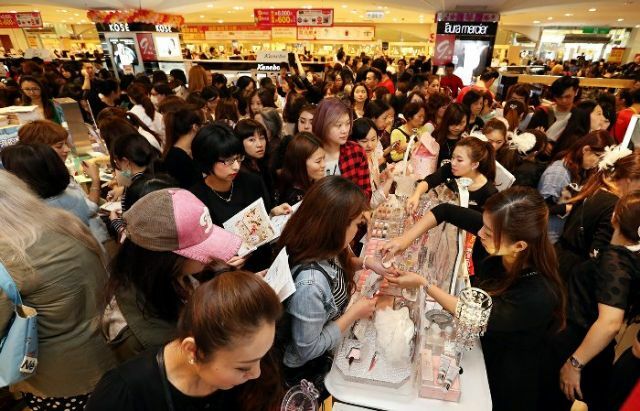 The MOEA reported revenues at local department stores, for instance, saw double-digit growth rate in December to total over NT$300 billion (US$9.52 billion) for the whole year, an all-time high. As for outlooks in 2015, the MOEA anticipates local businesses to likely gain steam from stronger consumer spending, fueled by factors including generally promising global economic climate, growing year-end bonuses, continuously improving employment and growing labor participation rate.